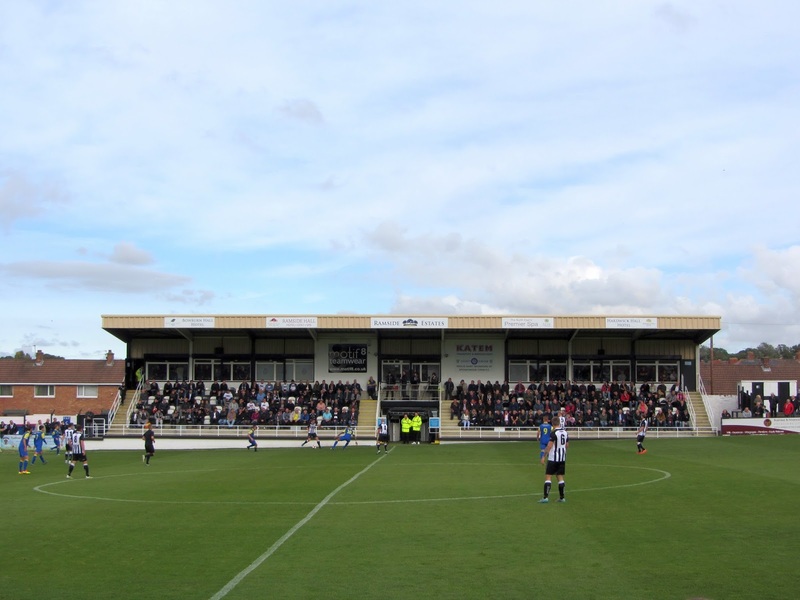 My seventeenth ground of 2016 was on Saturday 1st October at Brewery Field in Spennymoor, County Durham. The match was Spennymoor Town vs. Chorley in the F.A. Cup 3rd Qualifying Round. Brewery Field is just to the north of the town centre and is surrounded by housing on all sides. The town of Spennymoor is not served by a railway station - the nearest ones to the ground are Bishop Auckland which is 5 miles south-west and Durham which is 6 miles north-east. 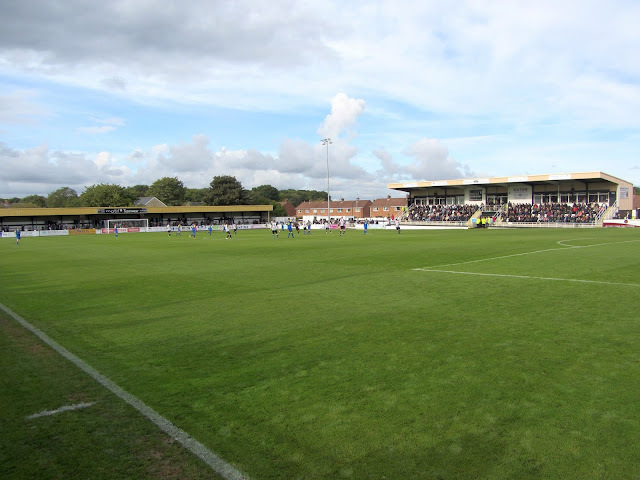 Spennymoor Town and its predecessor Spennymoor United have played at the venue since 1904. The east side of the ground can be split into three sections - in the middle section there is an all-seater stand with 224 seats. The seats are split into two sections of 112 with the players tunnel leading from the dressing rooms separating them. There is then a bar at the top of the stand which looks out onto the pitch. The southern third is taken up by an uncovered concrete terrace and the northern third is an uncovered flat area of concrete. The north-east corner also has a shipping container which holds the club shop and a food outlet. The west side of the ground can also be split into three sections with three rows of uncovered concrete terracing for the northern and southern third and a raised large flat section in the middle elevated above the two dugouts. Upon my visit the north and south ends behind the goals both consisted of a concrete terrace with six levels with the northern terrace covered and the southern terrace uncovered. 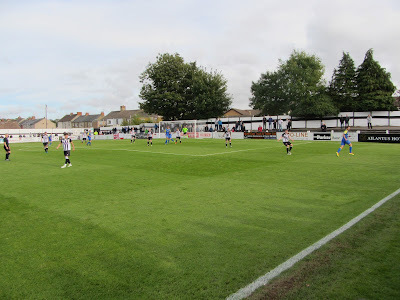 With the club's rise up through the league ladder the northern terrace has since been converted to an all-seater stand. This was an F.A. Cup 3rd Qualifying Round tie between Northern Premier League Premier Division side Spennymoor Town and National League North side Chorley. The lower division side started well and went close in the 20th minute when Shane Henry fizzed a shot just wide from 20 yards. Though the hosts were on top they took a big hit in the 37th minute when they were reduced to 10 men. It came about when defender Chris Mason and Chorley's Jason Walker tangled just outside the box - with Mason the last man the referee dismissed him from the field of play. Spennymoor initially didn't let this affect them as they almost took the lead in the 46th minute when a deflected cross had to be tipped over the bar by the backpeddling keeper. 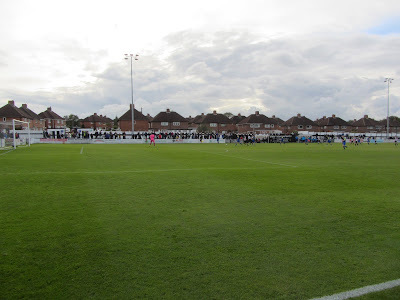 After this Chorley had a spell of concerted pressure but despite several crosses across the six yard box there was no final touch to give them the lead. Failure to take these chances cost them as in the 64th minute Rob Ramshaw got into the Chorley box, crossed to the back post and Glen Taylor rose and powered a header into top corner. In the closing stages Chorley again hammered away at Spennymoor and saw a header cleared off the line but the lower league side held on to win 1-0. 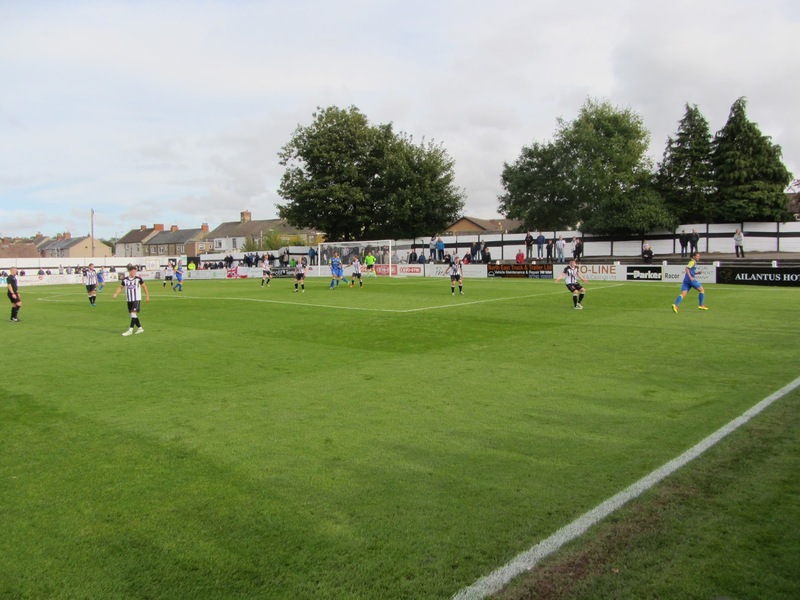 Spennymoor's perseverance was rewarded with progression to the 4th Qualifying Round where they beat Lincoln United before ultimately going out to Football League One side Milton Keynes Dons in the 1st Round Proper.